Hooking into a “screaming chromer” is thrilling. This refers to the steelheads tendency to run and jump once hooked and pull line giving your drag a real work-out. In spring, steelhead move up rivers and creeks that feed the Great Lakes is great numbers. Once the season opens anglers will crowd well know holding pools where action can been non-stop all day. Most use noodle rods, rigged with light line 4-6lbs and either a float reel / centre pin reel or spinning reel. Float fishing with roe is the staple here and has proven to be the top producing tactic. Although the use of flies, such as wooly buggers, stoneflies and egg patterns are also effective. 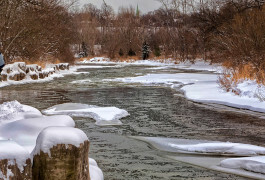 The main rivers attracting attention are those near urban centers, namely the Ganaraska River in Port Hope, the Credit River in Mississauga, the Grand River, the Niagara River, the Nottawasaga, Saugeen and the Maitland river. Average fish are between 4-6 lbs, although fish in excess of 20lbs are caught annually. Once the spring runs are over and the steelhead return to the Great Lakes, they can be caught all summer trolling the depths with a wide variety of lures. Although the most common lures, include spoons, like the Northern King and body baits. Colour patterns vary, although the most productive colour combinations seem to be green/silver, orange/silver, pink/silver and blue/silver. Any lure that mimics the baitfish in the area is usually a good bet and can be productive. In Lake Ontario, anglers generally troll their lures anywhere from 70ft to 250ft. Key trolling depths are dictated by the temperature. Generally 60 to 65C is the preferred summer target temperature. Having a temperature sensor on your cannon ball can eliminate a lot of the guess work, when targeting temperature bands, although experimenting and trial and error can be equally effective at locating active summer steelhead in Lake Ontario. Lake Erie is another great lake with a phenomenal steelhead fishery. 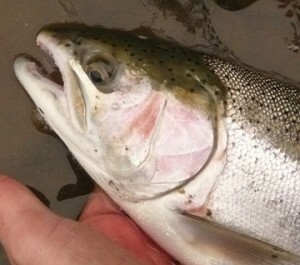 In summer, the steelhead will be deep, and in Lake Erie this 60 to 80 ft. 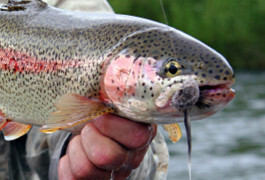 The same techniques apply with anglers generally trolling for steelhead using spoons and stick baits that mimic the available forage. Many anglers also use dipsy divers which can be used to bring your offerings down to the preferred depth without the use of expensive down rigger gear. While trolling for steelhead on Lake Erie, don’t be surprised if you catch a bonus walleye, as these aggressive fish will generally hold in similar areas to steelhead. Another critical factor when trolling for summer steelhead, besides the temperature is trolling speed. The most common trolling speed seems to be anywhere between 2-2.5 mph. Also take into consideration the wind direction while trolling as it can have a great effect on your trolling speed. The use of a drift bag is highly advantageous on days where controlling your speed may be a problem. Of course anytime you are targeting a predatory fish, like steelhead trout, look for bait balls. Anytime you are marking bait on your finder, usually the steelhead are not far behind. 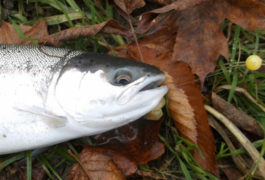 In the fall, the river fishery comes back to life as fresh run chromers enter the rivers once again, this time following the salmon runs in search of food. This can be one of the most productive and exciting times of the year to fish for steelhead, as many fish are fattening up for the winter and readily take the anglers presentation. If you haven’t tried steelhead fishing in Ontario. You must, I guarantee you’ll be hooked!